Stick relaxing on the aft deck. Have you ever gone cruising with a cat? Last week was a first for Wayne and me. Our cat Stick Tail now travels with us. Most of the time he stays at home in the float cabin, content to sleep on his loft bed. But if we are going to be away for more than one night, he needs to go with us. A protected sleeping spot under the V-berth. Last week Wayne and I took our Bayliner 3058 out for a three day cruise on the chuck (ocean). Stick came along. Traveling in a bouncy, noisy powerboat wasn't his favourite thing, but when we were at anchor, he settled in and was quite comfortable. Stick's spot under the captain's chair. We're already planning our next boat trip with our "chuck cruising cat." We learned a lot on this trip to make it a better for all three of us. Take something that smells like home. We chose Stick's sleeping pillow covered with his favourite afghan. Set up the boat for your cat before he or she arrives. Block off any hard to reach hiding places, but leave a few spots that will give your cat an enclosed, protected feeling. Pick locations for litter box, "food bar," and sleeping spots that are easy for both you and your cat. You don't want to be tripping over things moving around in confined spaces. 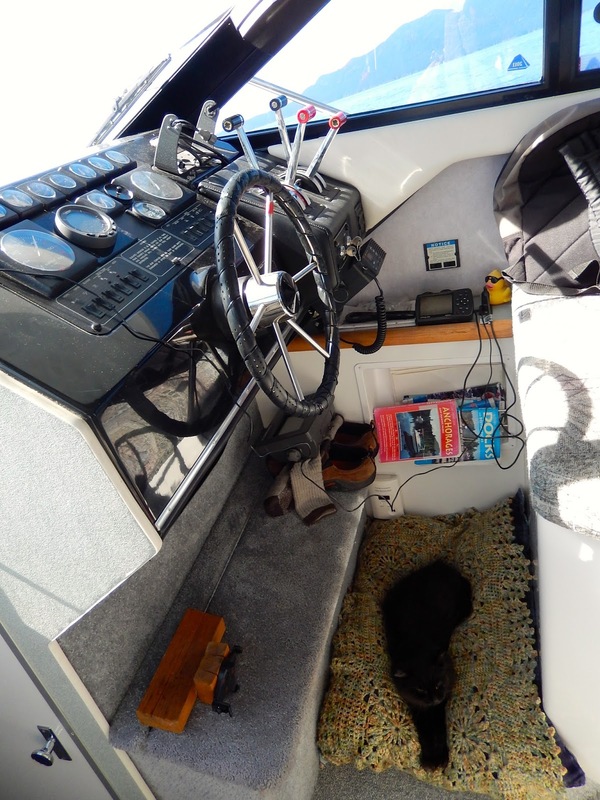 Let your cat stay in the boat while it is still docked to get used to the unfamiliar surroundings. If you are in a powerboat, take it slow to begin with. It takes time for everyone to get their sea legs. Stay with your cat until you are sure he or she is comfortable while under way. I held Stick on my lap, and then sat next to him in his captain's chair bed. Check on your cat periodically during cruise. If it's going to be a long trip at high speed, take a break for lunch or a snack. Make sure your cat is eating and drinking plenty of water. This is especially important for senior kitties. When it's time to anchor, give your little guy lots of love and hugs. It's time for everyone to have a happy hour! Stick in his familiar bed with his favourite afghan. Wood is a very important part of our lives. Our floating cabin is wood framed and built on a large raft of cedar logs. Our "yard" is bordered by log booms. We use floating stumps for protection from waves and decoration. Firewood keeps us warm all winter. Whenever wood floats our way, we think about ways it can be used. One day a large end piece from a cedar float log drifted up to our cabin deck. It was mostly submerged, but when we saw what it was, we decided to pull it aboard to save for a future use. And there it sat waiting for two years. We were down the lake visiting our good friend John, and he showed us how he used a log round to make a portable installation for a hand winch to draw his tin boat up on the dock for storage. We thought, what a great labour saving device! Wayne first tried installing a winch on the back dock with a smaller round from our firewood stash. But it was too short and wimpy (you can see it in the last picture). Even though it would be hard to move, we knew the large cedar chunk would be perfect (and just like John's). Each year we love watching the birds that arrive in spring and stay with us all summer. Two weeks ago, our Violet-green Swallows fledged. One day they were there, the next they were gone. Kind of gives a new meaning to "empty nest syndrome." But we still had Barn Swallows. You can hear them peep every time Mom or Dad come up to the nest at feeding time. Here are two of the three chicks on July 17. All hungry mouths. Here they are on July 25. Quite a difference in only eight days. Then on July 26, look what I found. One of the chicks was sitting on the peak of the roof. Brave little guy to be first to fly. Wayne and I have been up the lake at the cabin a lot this month. The weather is great, and the water is warm for swimming when it's hot. Sunrise over Goat Island give us a spectacular start to the day. OK, I know what you're thinking ... fish, right? Well, our catch and release system extends from fishing to other critters as well. 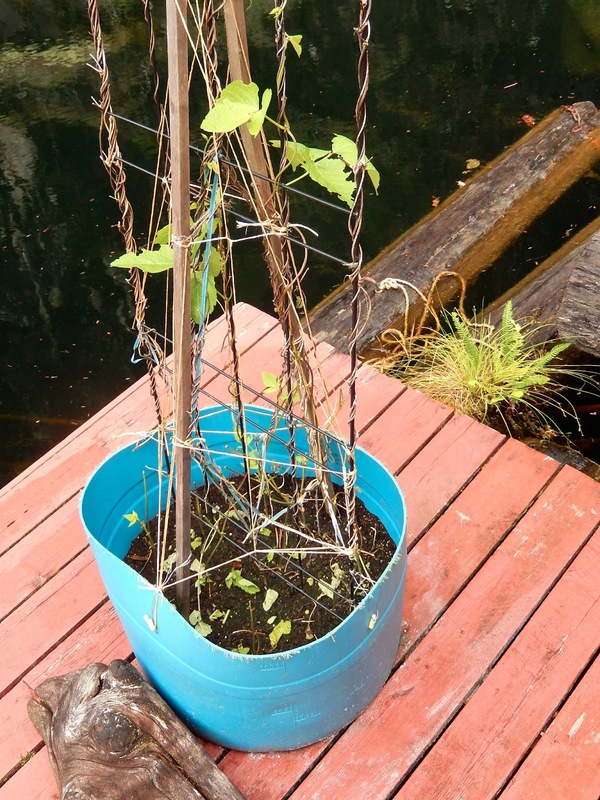 You've read about how we annually catch Woodrats (Packrats) that invade our garden and deck pots. In fact, we had to deal with one just last month. You may have even read about Margy's Mouse Mechanism. We've been pretty lucky with mice in and around the cabin, but this summer several have made their way out to my floating garden and have taken a liking to my carrot tops, beet tops, and especially my strawberry plants. It was time to bring out our Havahart live mouse trap to the remove the little guys and give my plants a chance to mature. So far, the mouse count is up to three. Wayne says it is hopeless, but if we can get them off the float, maybe no more will board for the rest of the growing season. I've got my fingers crossed. Last week when Wayne and I were enjoying the lake in our tin boat, I happened to look up and see something dark moving across a rock slide on the lake shore. At first I thought it might be a black wolf. One has been seen in our area. But as we moved closer, it was obviously a black bear. 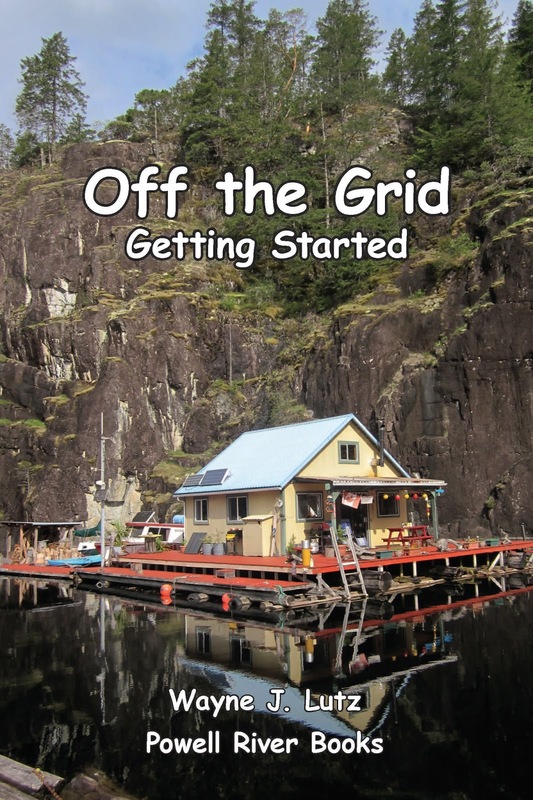 Back in April, I shared how our float cabin is anchored to shore with steel cables. Steel is strong, but subject to the wear and tear. The attachment point of the cable holding our transition float frayed. Wayne make a temporary fix with rope that lasted us through the final spring storms. John is our good friend, and the builder of our cabin. He came up to make a permanent repair. He determined that the rest of the cable was in good condition. The anchor point was the weak link, probably because of movement during windy storms. There wasn't enough slack in the cable for a new loop, so he "invented" a new system. Taking a piece from logging history, a boom chain, he fashioned a new attachment. A section from an old chain containing the large round end was cut to length with a hand grinder. Then the chain end was attached to the eye on the granite cliff with a shackle. Now that will never fray! Then, the fresh cut ends of the cables were attached to the round ring on the other end of the boom chain with secure cable clamps. As far back as I can remember, Mom was an avid crocheter. 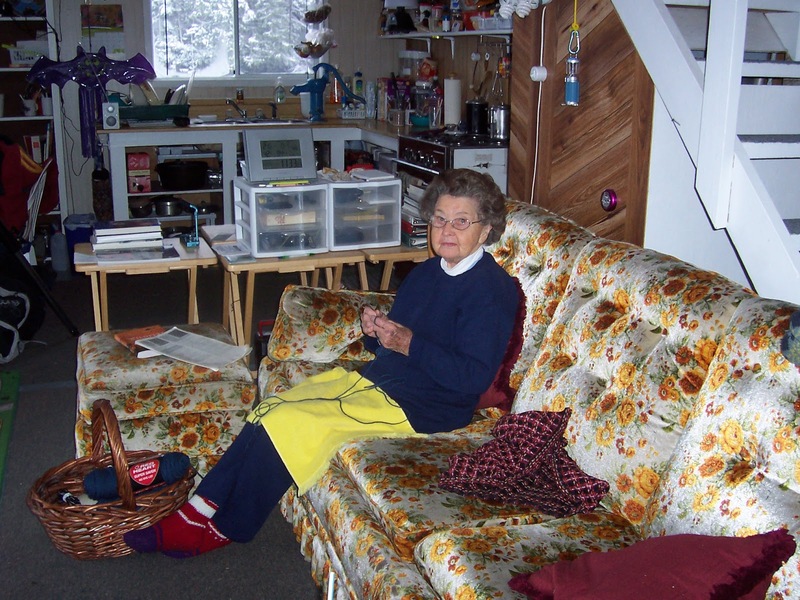 She made numerous shawls, ponchos, doilies, Christmas ornaments, and afghans for family and friends. Her beautiful afghans became donations for club raffles and PEO scholarship fund raisers. When I was little, I have vivid memories during camping trips of Mom sitting on large granite rocks, or fallen logs, crocheting away while Daddy and I fished in a stream nearby. Mom loved the outdoors, but wasn't a fisherperson. In later years, crocheting was limited by arthritis. Yet she continued to make afghans. Her favourite method was crocheting squares and then sewing them together to create the final product. For entertainment, she would crochet a square before bed. That way she could savour the experience. Wayne and I have lots of beautiful afghans to remember Mom by. And so does her (now our) kitty Stick Tail. My favourite is on our bed. It makes our mornings colourful and bright, even on cold winter days. Guy in biker gear: Just got back from a friend's cabin. Girl in short shorts and a shorter top: Oh? Guy: Yea, had a great time. Guy: Not far from Elvis Point. The conversation was intriguing. Maybe we should rent one of the small tin boats at the marina and take a look at this lake for ourselves. Well, if you've been reading my blog, you know that boat ride resulted in us finding the home of our dreams ... but back to the reason for this post, Elvis, better known as THE KING. Powell Lake has acquired quite a few colourful place names: Hole in the Wall, Three Mile Bay, The Washout, The North Sea, Stump Creek, and Elvis Point. The King came to Powell Lake because of local fan. He perched on the cliff behind her cabin to croon her to sleep with strains of Love Me Tender. But in the Winter of 2007, it was more like Heartbreak Hotel. Elvis "left the building" or more specifically the cliff for parts unknown. Even though he didn't grace the rocky wall with his presence any longer, his spirit lived on. We live in Hole in the Wall on Powell Lake, BC. 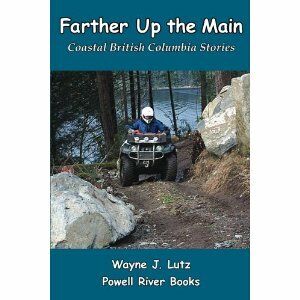 It's near a location known locally as First Narrows. First Narrows is about 25 minutes up the lake (depending on how powerful your boat is). Before the dam was installed at the paper mill in town, First Narrows was a shallower constriction between the upper and lower sections of this massive glacial carved lake that still harbours ancient salt water at the bottom. Every year I have to do battle with the neighbourhood Bushy Tailed Woodrat (Packrat). Some years, it's more than one. Some years, like this one, it's both spring and fall. The first hint that Ms. Woodrat has arrived is "harvesting" displayed in piles on the cabin deck. The second hint is flowers and vegetables nibbled right down to the dirt, not a pretty sight. Several seasons ago, we purchased a Havahart 0745 live trap for squirrels, rats and chipmunks at Rainbow Valley Pet and Farm Supplies. Wayne loaded it up with peanut butter as bait. By the second night, we had success. Bye-bye Ms. Woodrat. The Woodrat is the only rat native to Canada. It eats leaves and seeds (and flowers and garden veggies). They live on cliffs (we've got a big one of those), and in abandoned buildings (our shed isn't abandoned but it's pretty quiet). A Woodrat is a large, gentle, squirrel-like rodent with soft grey and light brown fur. Its large eyes and ears, and bushy tail make it easy to identify. In addition to storing food, Woodrats are notorious for taking and hiding bright shiny objects. Sunshine on the Sunshine Coast in British Columbia. I love used bookstores. 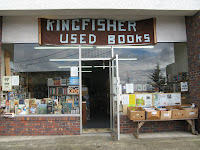 Right across the street from our Powell River condo is Kingfisher Used Books. I like to go there and browse the shelves. In addition to used books, they have a shelf for local authors. I found a book that caught my interest. I’ve heard of the author before around town in writing circles, but haven’t had the opportunity to meet her yet. How to keep a human: as told by Amaruq is a unique book because it is told from the perspective of a wolf-malemute. It was written by Kaimana Wolff, the author name of Eva von Loon. Amaruq's puppy name was Sojourner. Early in his life, his heart was won over by a "human ape female" who could speak his true name, Amaruq (wolf). The story is told by an older Amaruq (Grandpaw) to a new litter of his grandpuppies who are ready to be weaned and need to "know what to expect. You won't be puppies forever." He begins with a story about his own puppyhood. He was born a city dog but dreamed of his true homeland, the True Woods, North of Sixty (the 60th parallel that forms the border of the Yukon, Northwest Territories, and Nunavut). This is the land where wolves (and wolf huskies) are watched over by the Goddess Silva. Each chapter is a vignette from Amaruq's life with his female human Pack Leader, Kaimana. 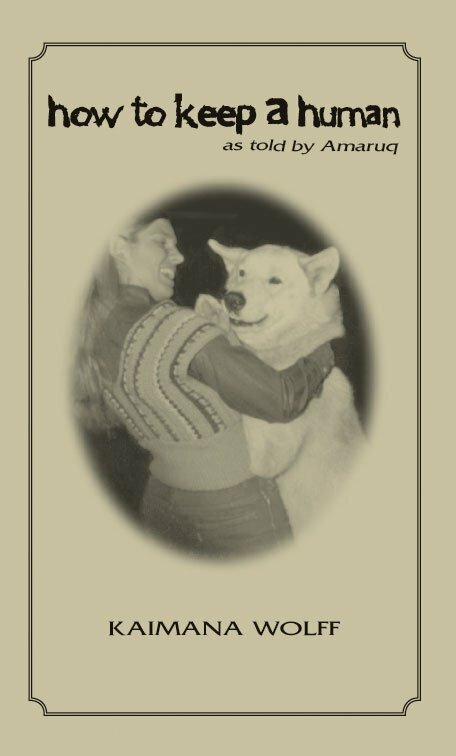 Amaruq was a unique, all white wolf husky called a Father Brown, a mixture bred to help pull freight sleds in the far north. As Amaruq says, "Our strength and brains are perfect complements for human weaknesses, you see. What would our humans do without us?" Amaruq follows Kaimana, his human Pack Leader, to university for what he calls Post Sick-and-Airy (took me awhile to figure that one out). Then finally to the True North for a job in Whitehorse, and finally to become the King of Dawson City. Throughout it all, he is Kaimana's constant companion, protector, and best friend rolled into one. It's a fun read that will warm your heart, and give you a greater appreciation for life in the True North. 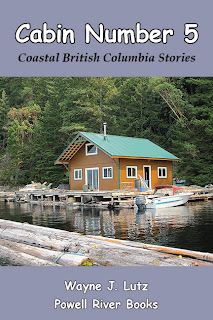 Additional reviews are available at Powell River Living and Immanence Magazine. What's a zunga? 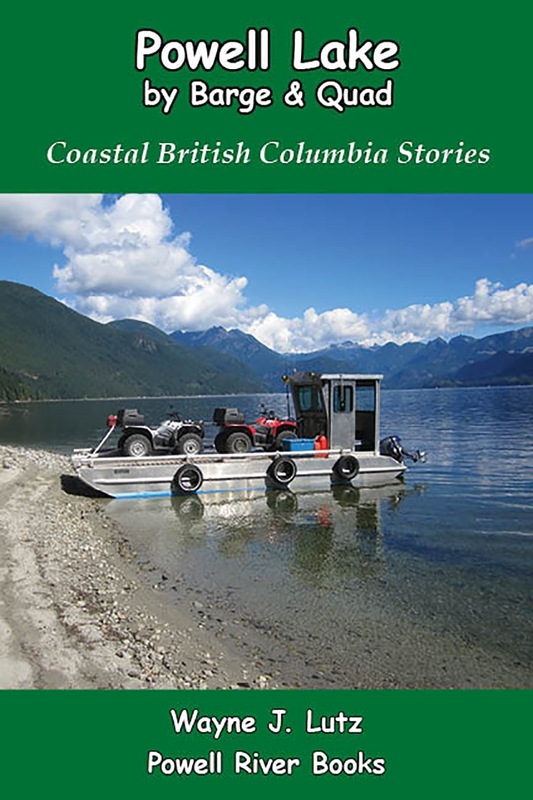 One even made the cover of the 2009 Discover Powell River Magazine. "You know someone is from Powell River when they know what the word zunga means. The term elicits confused expressions from those who had not grown up knowing the joy of swinging at the end of a rope and dropping into refreshing lake waters. It’s exhilarating." Zungas have a long tradition on Powell Lake in Coastal BC. When the weather warms, Powell Riverites head "up the lake" to cool off at float cabins or along the shoreline. Hey, that's right now! 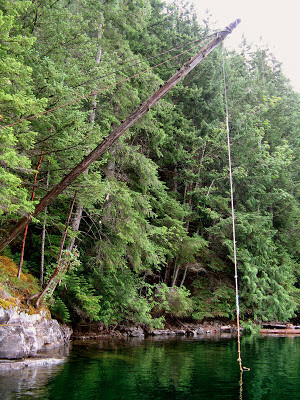 Most zungas are heavy ropes suspended for trees hanging over the lake. That makes them perfect platforms for swinging out over deep water. At our good friend John's cabin, he built a frame for his zunga. That takes zunga construction to a new height. Here are some Powell River kids enjoying a zunga on Powell Lake. Last week we went airplane camping. In many ways, it's similar to car camping. You pack up the tent, sleeping bag, air mattress, chairs, lanterns, and cooler. For longer trips, you can take the Coleman stove and all the cooking and eating paraphernalia. When I was a little girl (some sixty years ago), I camped by station wagon with my parents. Dad outfitted the car with a fold-down commissary in back and room when the back seat was down for them to sleep. I slept on the front seat. Once we got to our destination, the tent stored in the top rack came down for more "luxurious" camping. If you've been following my blog, you know I hate to give up on things that can be refurbished and reused, especially something with such sentimental value. Because we use flannel sheets inside, only the top edge has started to fray. On our last camping trip to Chehalis Airport, I used the picnic table to do some mending.